The Enchanted People were off to the Fairy Carnival which was to be held in the grounds of the Silver Palace. Rows of dragon-flies were parked outside the mushroom houses, waiting to take the little folk. "Oh, dear," sobbed a Pixy, who was dressed as a pierrot, in a white satin suit of lily-petals, "my ruffle hasn't come." "How dreadful," said his neighbour, standing under the pink veranda of his toadstool. He was dressed as a huntsman in a scarlet coat of poppy-petal silk. "Where did you order your ruffle?" "From the Pixy Pedlar," said the Pierrot. "He's no good, you should have gone to the Fairy Court Dressmakers," called the huntsman. The air was full of gay figures skimming along on their dragonflies, when along came the Pixy Pedlar. I can't find a ruffle anywhere, " he said. "I've searched every field for a dandelion clock." A Sprite ran past, and over his shoulder was a green polished stem, and on the end of it a fluffy dandelion clock. HI!" 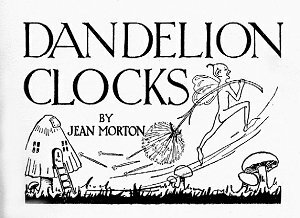 cried the Pedlar; "I'll buy that dandelion clock. I want to make a pierrot's ruffle." "You can't have it," said the Sprite. "I'm sweep to the Royal Family, and I'm off to sweep the palace chimneys. I'm very late, but I couldn't find a brush. The children pick them and blow them." "I'll sweep the chimneys for you after the carnival is over, if you'll only let me have your brush for a ruffle," pleaded Pierrot. And that was how he got to the carnival. Poor little thing. He was tired after dancing all night, and he cried when he saw that the palace had one hundred chimneys, and he had to climb up them all. So please remember not to blow all the dandelion clocks you find!